Social Security: Do Specific Social Relationships Make Animals Safer? Social animals may share resources with others, be exposed to pathogens from sick group mates, and may have to allocate time to working out dominance and other relationships with fellow group members. Given such potential costs, what might be the benefits of living with others? Most species have to avoid predation at some point in their lives, and many species are particularly vulnerable while foraging because they must focus their attention on acquiring food rather than scanning the environment for predators. Temporarily aggregating with others is a time-tested strategy to reduce predation risk while foraging because there are more eyes to detect predators and because if a predator attacks a group, the risk of predation is diluted (assuming that the predator only kills a single individual). Such temporary interactions need not result in long-lasting social relationships. 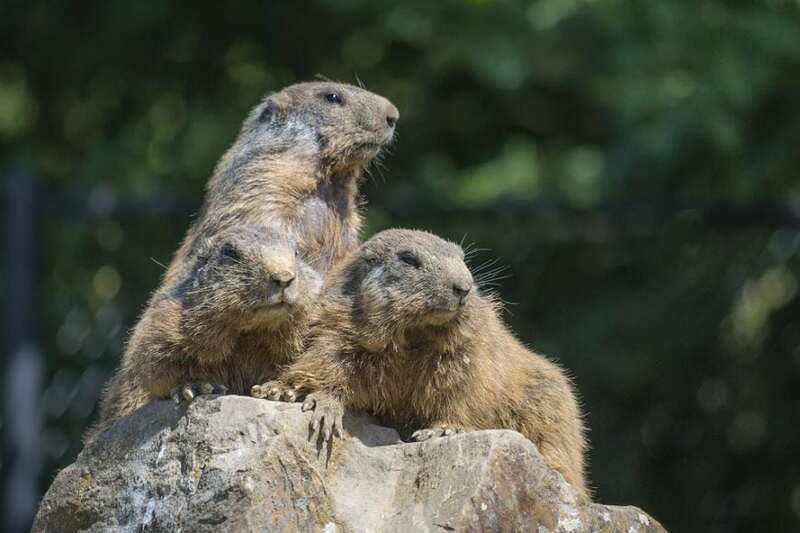 But the benefits of grouping are not restricted to those who forage together, and for species that live in a fixed location, as seen in ground squirrels, marmots, and prairie dogs, there may be additional benefits from developing more long-lasting social relationships. We are in the midst of a revolution in the analysis of animal social relationships, and we now realize that the benefits of living in a group may emerge from more than simply living with a number of others. Social network analyses permit precise attributes of sociality that may involve both direct and indirect interactions with others in the group. For instance, some metrics simply quantify the number of individuals one directly interacts with, but other metrics acknowledge that all individuals are not equally interactive. Some individuals are more interactive than others and by interacting with such highly interactive individuals, a less interactive individual may obtain information, pathogens, or potentially social status. My lab is exploring potential benefits of sociality that may emerge from specific types of social relationships. We study yellow-bellied marmots (Marmota flaviventer), a large, facultatively social, diurnal, ground-dwelling squirrel. The marmots we study have been studied continuously since 1962 in and around the Rocky Mountain Biological Laboratory, near Crested Butte, Colorado, a high alpine field station in the Rocky Mountains. We study marmots in subalpine meadows that vary in size. Small meadows may contain an adult male and female and their young of the year, while larger meadows may have multiple breeding females, their offspring and, in some years, multiple breeding males. Social groups are matrilineal in that they grow when a breeding female permits her yearling daughters to remain with her rather than dispersing. This creates a variety of different group sizes. Such variation is essential if we wish to understand the potential adaptive value of sociality. We trap, mark and follow individuals throughout their lives. This permits us to quantify the group size as well as keep track of social interactions. From the set of social interactions, we calculate a series of social network statistics that describe how interactive and connected each individual is. For this study, Rachael Mady and I asked how a variety of these social network values were associated with how vigilant animals were while foraging. And, while animals live in different sized groups, they also could forage in differently-sized aggregations. Thus, we aimed to tease apart the value of social groups, foraging aggregation sizes, and the specific social relationships individuals had with others. We expected that if animals perceived greater safety, they would be less vigilant and hence could allocate more time to foraging. Thus, if any of the social network values were associated with reduced vigilance this would constitute evidence that social relationships were beneficial. We found that females in larger social groups looked less, and we found that males in larger foraging aggregations looked less. This suggests that females perceived greater safety from social living — but the specific network statistics we quantified were not as important as simply living in larger social groups. And this is consistent with the female-centric nature of marmot social groups. Males, by contrast, only perceived increased security when they were foraging around others; social relationships were not as important for them as the potential benefits from greater detection or dilution when specifically exposed to risk. These results can be contrasted with other studies from our lab that have shown, in other situations, specific social network statistics are associated with vulnerability or security. For instance, more socially connected marmots are less likely to emit alarm calls than more socially isolated marmots. Clearly, more work is needed to better understand the adaptive value of social relationships, but, taken together, our work is slowly revealing the complex ways that benefits from living in groups plays out in a risky world. These findings are described in the article entitled Social security: are socially connected individuals less vigilant? recently published in the journal Animal Behaviour. This work was conducted by Rachael P. Mady from Towson University and The Rocky Mountain Biological Laboratory and Daniel T. Blumstein, who runs the marmots of RMBL project from The Rocky Mountain Biological Laboratory and the University of California Los Angeles. Daniel T. Blumstein is a professor at the University of California, Los Angeles | UCLA · Department of Ecology and Evolutionary Biology & The Institute of the Environment and Sustainability.